Best smile comes with a first impression! Every one of us starts off with beautiful white teeth, but strongly coloured-foods and drinks like coffee, tea, and cola can discolour the surface of your teeth. After a period of time, these stains penetrate deep inside the teeth. Just like white clothes which have picked up dyes and can never regain their original brightness, stained teeth are very difficult to whiten with conventional methods. These treatments are popular due to being safe and effective. When you visit the dentist will apply a gel liquid to your teeth that will then be activated by the light. With this treatment, you can whiten your teeth by up to 8 shades in a single appointment. It is more suitable for individuals who wish to lighten their teeth color gradually and at the convenience as well as the comfort of their own home and time. Not only do you get to whiten your teeth while kicking back and enjoying a movie marathon night at home, these kits come at very pocket-friendly prices as well! We recommended for you to consult our dentist to ensure that your teeth and gums are healthy and suitable for whitening. Our dentist is likely to record your initial tooth shade and take impressions of your teeth to fabricate a customized bleaching tray to fit your dentition should you decide to proceed. 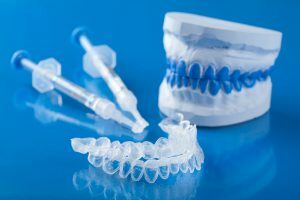 Not only will having a customized tray make it more comfortable for you during the whole bleaching process, it also makes the procedure much safer, ensuring that the gel is evenly distributed and sufficient coverage of the targeted teeth. Having a custom-made tray will also prevent direct contact of the gel with the soft tissues of the mouth and reduce gel leakage.